Schools in over 20 Kentucky counties have announced closures on Friday as teachers across the state protest a last-minute bill passed by the Republican-led legislature that overhauls the state’s struggling pension system. The bill removes some of the most vilified provisions of previous proposals. Current and retired teachers, who are not eligible for Social Security benefits, would still get annual raises of 1.5 percent in their retirement checks. And current workers would not have to work longer to qualify for full benefits. But new hires would be moved to a hybrid plan. They would be guaranteed to get back all of the money they and taxpayers contributed to their retirement accounts, plus 85 percent of any investment gains. The state would keep the other 15 percent. “Think about that. That’s insane,” Republican Rep. Chad McCoy said. But the bill would also remove new teachers from an “inviolable contract” that would protect them from future benefit changes. Retired educators like Carlotta Abbot worried about how it would impact the future of their profession. 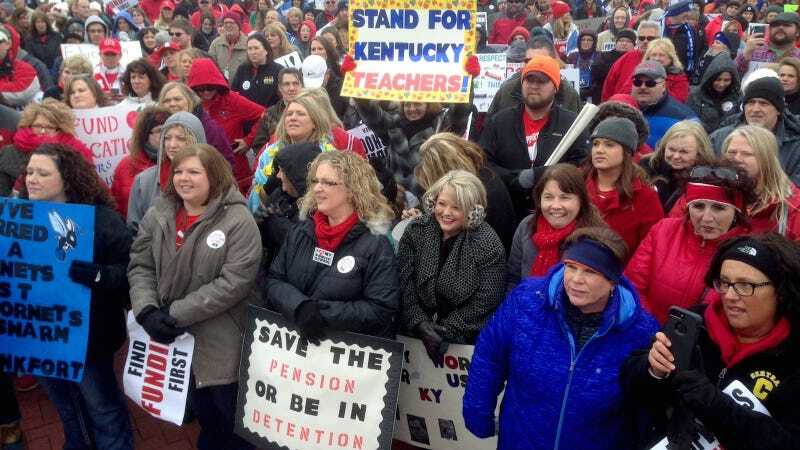 Women make up 78 percent of Kentucky’s teachers, and over a thousand of those teachers called in sick today, joining a wave of strikes in West Virginia, Arizona, and Oklahoma. Many headed for the state capitol in Frankfurt, where they are protesting both the bill and its secretive, lightning-fast passage, which made no time for public comment or analysis. The Jefferson County Teachers Union called the bill unconstitutional and plans to sue, claiming the legislature broke state law by passing it without the required actuarial analysis. Attorney General Andy Beshear has also said he will sue to block the bill from taking effect.